Celebrating 10 years of journey and hard work, Wall of Fades will entertain the crowd of denim enthusiasts with bigger attraction. There will be various talk show with well-known brand owners such as Bagus Satrio (Sagara Bootmaker), Ahmad Hadiwijaya (Oldblue Co.), & Kimberly Chrisya (Urban Sneaker Society) and also international denim enthusiasts with Robin Meijerink (Robin Denim) & Ruedi Karrer (Jeans Museum of Switzerland). 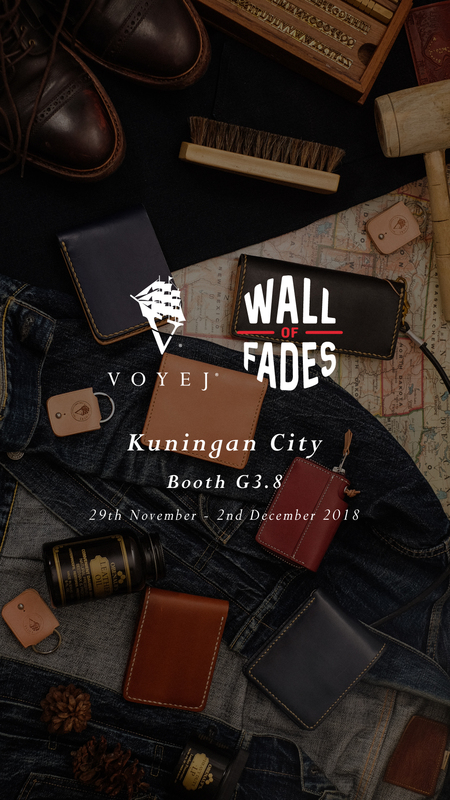 Being the part of denim-enthusiast community, we'll be opening our humble space at the Fashion Market area at the booth G3.8. Besides the new collection that will be available during the event, we will also offer the visitors with Exclusive Trade-in Program, Bucket of Sale items, free gifts, and free service for all VOYEJ goods (stamping and treatment). This year’s exhibition will be held in Kuningan area, inside of Kuningan City mall to be exact. Being a decade since the first ever Wall of Fades, we expect to meet some of the great denim-headed generations at the Wall of Fades 2018.